A thief may have tried to steal away your heart, but you aren't destined to be marked by that person's sin. Melissa was walking home from the bus stop and stopped to talk to the friendly neighbor who always sat in his driveway. He waved her over and invited her to follow him into his garage for a piece of candy. She walked into the garage an innocent, trusting girl, but she walked out broken. As she grew up, Melissa spent many years trying to heal herself. Over time she perfected the art of wearing a mask, while on the inside she felt unworthy of any good thing. She often wondered if she'd ever be whole. Perhaps, like Melissa, a thief stole a piece of your heart. You might have even wondered if God cared that it happened. God does care and to prove it, Titus 2:14 tells us Jesus made the ultimate sacrifice: "He gave his life to free us from every kind of sin, to cleanse us, and to make us his very own people, totally committed to doing good deeds." In this verse, the apostle Paul describes the death of Jesus as an offering. It was given for those who couldn't make it themselves. Jesus gave His life willingly and to free us from every kind of sin. We often give thanks for His sacrifice that removed the debt of our sin. But there is more. Jesus took our sins, but that same act freed us from the effect of others' sins upon our hearts and lives. Let that soak into the wounded places for a moment. A thief may have tried to steal away your heart, but you aren't destined to be marked by that person's sin. Hurtful touch no longer defines you, for Jesus' touch brings you from death to life. From old to new. You are beautiful, not because of what you have to give, but because of whose you are. You have value, not because of what someone wants from you, but because of what has always been inside of you. You are in the process of restoration, and you have purpose because of Christ's love. Healing is a transformative process, peeling away one layer at a time. That process begins as we accept that Jesus boldly walked into the den of a thief on our behalf and reclaimed what was His own. That act took the damage inflicted on your soul and carried the burden you were never intended to bear. And what happened to that little girl, Melissa? After years of trying to fix herself and hiding her hurt, she asked Jesus to touch the broken places. Today Melissa Taylor is a mom, a wife and a woman who finds joy in pouring out God's hope to others. 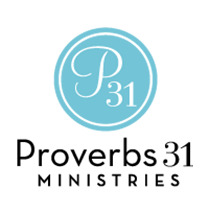 She leads thousands of women across the world in online Bible studies through Proverbs 31 Ministries. If you were to ask Melissa who she is, she would say she doesn't see herself as a woman marked by a thief, but a woman reclaimed and restored by her Savior. Father, You see who I am, ready to burst forth because of Your sacrifice. Thank You for touching my heart and my thoughts in a way that is holy and restorative. Thank You for taking away the mark of others' sins upon my heart. In Jesus' Name, Amen. Jesus never saw a single person as too damaged or broken. How do you believe God, the One who created you, sees you? What might His vision for you be?